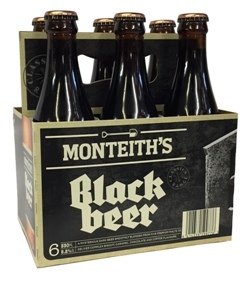 Monteith's Black is true to the heritage of dark, smooth West Coast beers and is a real New Zealand masterpiece, blending five premium malts to produce a complexity of flavour and a dark chocolate aroma. The mouthfeel is rich and smooth, but not heavy in texture, with a crisp and hoppy finish that lingers on the palate. There are NOT enough brewers, making DARK ALES. There is a reason for that, the brewer must have OUTSTANDING BREWING SKILLS. "MONTEITHS BLACK BEER", CONTAINS ALL THE RIGHT TEXTURES, FLAVOURS, AND AFTERTASTE PLEASURES TO SATISY THE DARK ALE/BEER ENTHUSIAST. "GIVE ME A FULL MONTEI!"